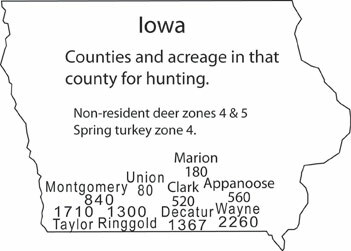 Iowa deer hunting in Zone 5 available acreage is at right. All hunts are self guided. The Association through an online hunting lease land map library and telephone reservation to individual numbers spots will get the hunter to the point of where to park his truck, step out and scout or hunt. Pre season scouting is encouraged. Scouting is not necessary. The hunter must supply all of his own equipment, lodging (listing provided), licensing and skill. Hunters are not limited to just one spot. Each may hunt the deer of choice by having more than one stand on each spot as well as stands on several spots. It is by this land coverage the buck of choice is found. A contrast would be having just one hunting lease and hope that a buck comes by. 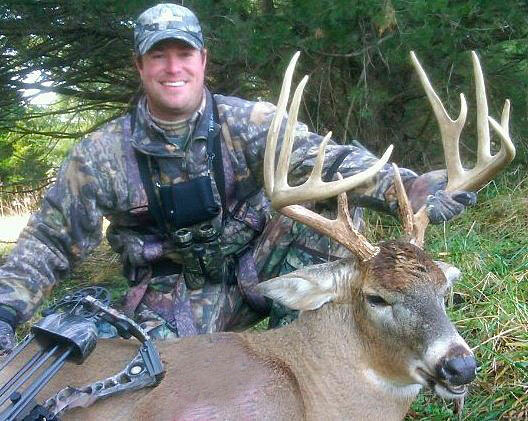 Many deer hunters assess a deer lease by aerials with the single criteria of woody cover. The more woods the better. We seek to expand the assessment criteria by including year round water, food source, and protective cover inclusive of brush and tall grass. The final element is assessing the isolation of the water, food and protective cover from routine direct human observation. 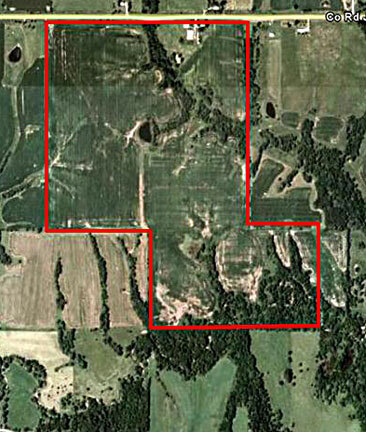 The aerial at right is the least valuable deer lease of the three presented on this page. The specific issues with this lease are the food source (crop fields) are too distant from the protective cover. Neighboring farm’s pasture land adjoins the best protective cover. Cattle ranchers will check cattle frequently doing so mostly by truck or ATV access. Much from the road direct observation. No water. 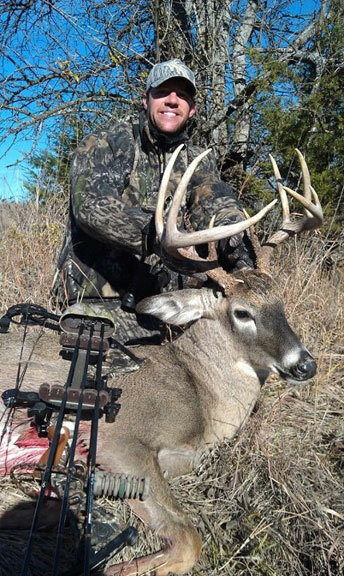 All that being said this lease may very well hold the best trophy Whitetail Deer to be seen. That probability however is greatly diminished. 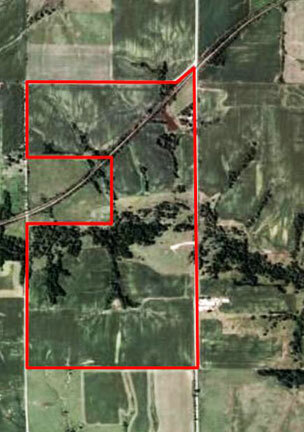 This one spot is in the Association’s land inventory as it is part of a large acreage corporate lease. As is always the case, all the land from any one owner is not always the best land. This spot would not gain our recommendation for a hunt. This land would be at the lowest scouting priority for any hunter in this area. That is all the more so as there are much better spots to hunt. The Iowa deer lease at right is the best to be found. It has a year round water source (stream) running right through the best protective cover (south end). The best area on this farm is out of direct observation from road and farm yard. It is surrounded by crop fields. The crop fields vary and are rotational between soybean and corn. No pasture in adjoining farms. There are many for this county smaller patches of cover in the immediate area (on and off lease). This allows for more deer to occupy the surrounding area without a single dominate buck or doe being able to patrol all. For all these reasons this land earns a higher hunt recommendation. A means by which we speed the land learning process for new to the Association deer hunters. Most after three years in the Association have found either through their own scouting or our recommendations a collection of farms they will want to hunt. That collection of spots is typically more than they will have time to cover. 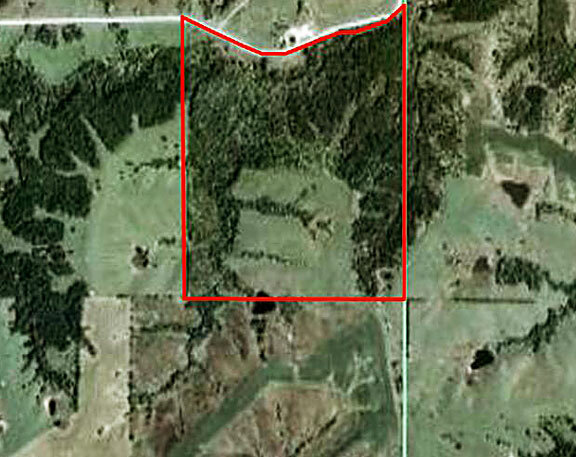 For no other reason than this lease has much woody cover it will receive more scouting and hunting pressure. This is hill country. Again part of the lesser land that accompanies large acreage leases. It is cattle/pasture country. No grain crops in the area. It will hold deer to include trophy bucks. Its likelihood of providing a satisfying hunt less so than other land in inventory. A business decision dating back to the Association’s inception in 1965 to lease rather than buy land. The value is as game patterns changed so must the Association do so to provide the best hunting possible. When it comes time to spend money the Association does so where it gains the best return for the hunter. The Association’s collective buying power allows acquisition of large corporate grain farming operations. The corporate farm is commodity centric maximizing a limited equipment set, limited knowledge/employee training and specific land use. The value to the Association hunter is these corporate grain farms do not have livestock in what the small acreage farmer would within wildlife areas of the farm land. These corporate farms provide enhanced wildlife cover. These large farms are of acreage size as to make them unavailable to the average hunter acting on his own resource. We avoid the irrational exuberance and any accompanying inflation beyond land value of specific localities that are highly competitive for hunting lease land. Within each state there is one or more small areas that have gained a reputation for trophy deer in excess of reality. This reputation drives up hunting lease costs for no other reason. We do not offer this Association of hunters as a trophy deer organization. We define our hunt quality as all may hunt any time during the season. For as many days as they have available and cover a good bit of ground. The hunts are for those that enjoy the ability to hunt free of the public or knock on door free access lands’ hunter mentality. It is for those that want to have more land available to hunt each day than daylight hours to cover. Hunts for those that enjoy matching wits with bucks. There are tangible benefits through our approach that does enhance the chances for success. One illustration is that our collective buying approach through the Association gains us large acreage deer lease land well in excess of what the average group of deer hunters could pool their money to acquire. We are able to lease large corporate farms. We focus solely on grain farming for the better deer hunting. A contrast would be to hunt within a cattle region. The advantage to these large acreage grain operations is their entire effort is on grains as opposed to a small acreage farmer that will be diversified with livestock in the wildlife areas. We also do have small acreage leases that will have cattle equal to the small acreage land investment group that leaves their land fallow. The effort in each case is to acquire the best land we can. Lodging is by local motel and other resources with a listing maintained by the Association. All will have a plan before leaving home. Each will know where they will be hunting and lodging. Meat locker and two truck services are also listed.